Scope: A proposed minor remodel of an important 1905 Greene & Greene house which was subject to historic preservation review. The owners asked us to design a modification of the north porch in order to create a breakfast room for their young family. Although it is controversial to make exterior modifications to an historic landmark, PECK helped them plan it in a sensitive way while adhering to the Secretary of Interior's Standards. The design was granted approval through the Pasadena Historic Preservation Commission and involved sensitive new millwork and cataloguing and storage of existing elements that were being removed. Scope: A kitchen, bedroom, and porch remodel of an historic home built in 1909. The design was subject to historic preservation review. PECK presented drawings to the staff at the City of South Pasadena to confirm compliance with the Historic Preservation Ordinance. The project was approved and constructed. Scope: The 1911 B.P.O.E. (Benevolent and Protective Order of The Elks) hired PECK to renovate their main banquet hall and restore it to it's previous glory. A wealth of original architectural detail lay behind wall coverings and a dropped ceiling that was installed to hide HVAC equipment installed mid-century. The Elks were in possession of many of the original drawings by Bennett and Haskell from 1928. PECK developed a plan to give The Elks back the original exposed ceiling trusses, decorative plaster pilasters, paneled wall treatments, while upgrading the ADA access, relocating the HVAC duct routing and relocating the HVAC equipment. In addition to the main auditorium, we designed a remodel of the adjacent bar area. We addressed upgrades to the fire protection measures, added a new doorway for fire exiting and proposed a new sprinkler system. Unfortunately, the renovation plans were never completed due to budgetary constraints. Scope: An addition of a master bedroom suite to a 1951 A. Quincy Jones & Whitney Smith House in the Crestwood Hills tract. Designed by PECK and Sergio Zeballos, the master bedroom suite was oriented at an angle to the main house in a separate wing and connected via a glass-clad hallway. The addition followed The Secretary of Interior's Standards as an appropriate approach to preserve as much historic fabric as possible while adding square footage to the existing residence. The project also included restoration of the kitchen, retaining it's original configuration. The restoration included work on doors and windows, interior finishes, the original redwood tongue and groove planking, floors, ceilings, exterior trim, and landscape. 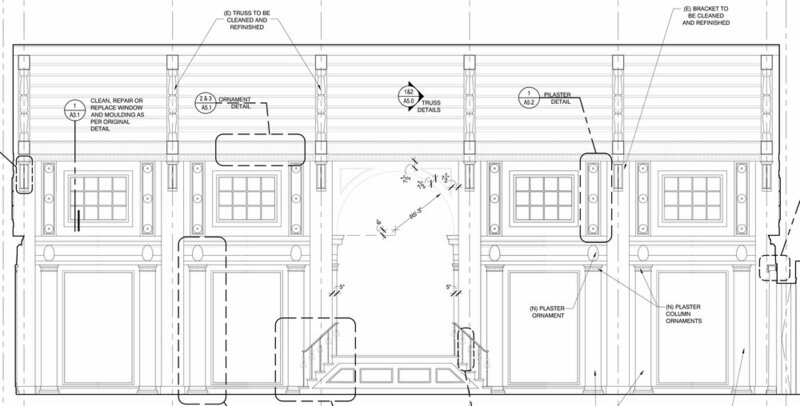 Scope: A front porch restoration project subject to historic preservation review. Originally a duplex built in 1924 and converted into a single family house in 1977, the porch was the central aesthetic feature and PECK was granted project approval through the City of South Pasadena. Scope: PECK provided Architectural guidance and Structural design for the rehabilitation of the historic 1957 post and beam modern home in Pasadena. Our work included restoration of original posts and beams subject to water damage, consulting concerning flashing and sealant strategies to limit future damage, conversion of storage space below the garage into a new bedroom and bathroom, reconstruction of the main entry stair from the carport, re-roofing and new gutter system for the carport, waterproofing of the basement retaining walls, structural support of the garage upslope foundations, addressing the glazing and supports at the breakfast room addition, seismic stability of the side yard trellises and deck. Scope: Developed terraced mid century landscape planters and pathways in the front yard, side yard fence wall structures, rear patio trellis structure, as well as modification to structural elements of the house. Scope: As structural consultant to Marmol Radziner, we developed details for structural remodeling, addition, and retrofitting of the 1963 Thorntonn Abel house, including provisions for shade pockets within a flat roof framing system. The building is constructed of cast concrete walls which need to be restrained to resist overturning in CA earthquake zone 4. We designed the two additions on caisson system per soil requirements, and following the design language of the original structure. Scope: PECK performed the structural design for the proposed Renovation of the 1942 residence by Bertram Architects. The design included strengthening as well as adding structural foundations and framing to accommodate relocating several interior walls. The project did not move forward. Scope: The project involves the adaptive re-use of several cottages on the site in combination with a new larger multi story hotel element on the west property and a new multi-story hotel on the east side of the property. Photo: Appleton & Assoc. Inc. Scope: PECK provided Structural and Civil designs for four distinct building types, including the rehabilitation of an historic three level building that was moved into a new foundation on the site from nearby Whittier College. Scope: The restoration and remodeling of the historic Rainbow House by John Lautner involved strengthening the primary “arched” glue lam rim beams, as well as reinforcing structural posts supporting the roof. Scope: This 1872 House is a contributor to the upper Thames Historic District in Newport. The project involved restoration of interior plasterwork, original windows, exterior woodwork, doors, hardware, roofing, and chimneys. Original wood flooring of southern pine was used to construct new millwork within the kitchens. Three kitchens and three baths were created as part of the project scope. Scope: The 1893 Madison House is the home of Pasadena Heritage, where Chris Peck served as a board member for several years and advocacy chair for one term. The house was donated to Pasadena Heritage for a 99 year lease and now requires a fair amount of repair. The red brick foundation was being damaged by moisture. Chris, along with several other engineers and architects that were board members, collaborated in order to provide the structural plans required for permitting and construction. PECK volunteered the effort to prepare the plan set that was used to restore the house foundation from a structural and seismic perspective. Scope: The 1898 Castle Green is now a condominium building. Having undergone a fair amount of weathering over the past 119 years, one of the stucco soffits on a cantilevered porch fell onto a roof below due to rusting steel within the balcony projection. Pasadena Heritage was contacted and outlined a work plan for the condo owners to address this situation. PECK acted as a technical consultant and provided the initial scoping regarding the proposed repair of the steel balcony supports. 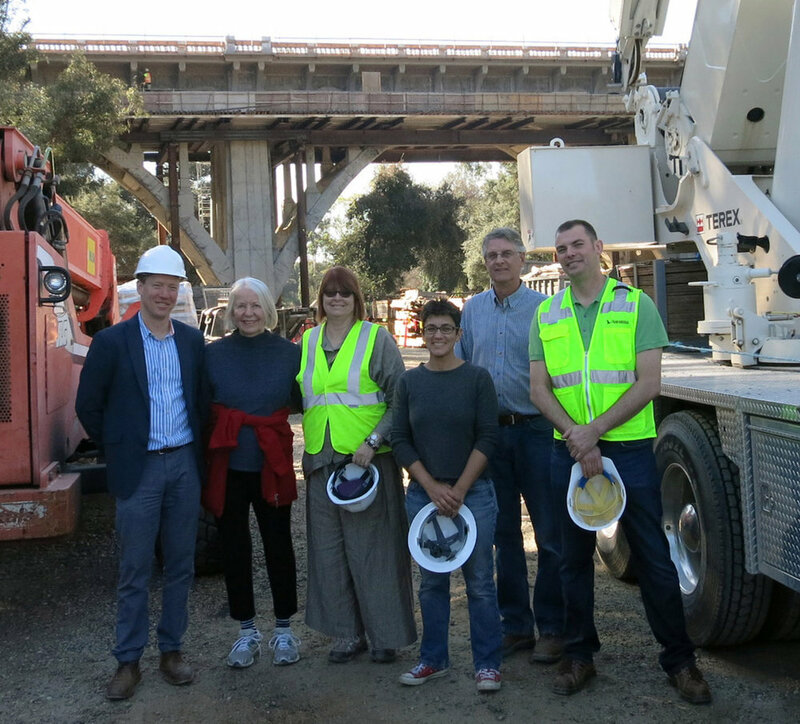 Scope: Chris is a member of the La Loma Bridge Design Advisory Group. Scope: PECK provided the drafting of a Markham District Map for Pasadena Heritage presentation to the state historic preservation office. Scope: Chris Peck is currently a member of the Advocacy Committee, the Advisory Council and a Heritage Associate and formerly a Chair of Advocacy and member of the Board of Directors. Chris is also a lecturer on Historical Building Techniques. Scope: Chris is a former member and Chair of Design Commission at the City of Pasadena and a former Chair of the Urban Forestry Advisory Committee. The Design Commission functions as the historic review decision making body for the City for several project types. Currently, Chris is a member of the Parks and Parking Committee for the Playhouse District Association.